Monitoring start times, breaks, lunch lengths, vacation days and sick days is a hassle. You’re busy. Your staff members are adults. If you think these statements are good reasons not to perform employee attendance tracking, the following consequences may change your mind. 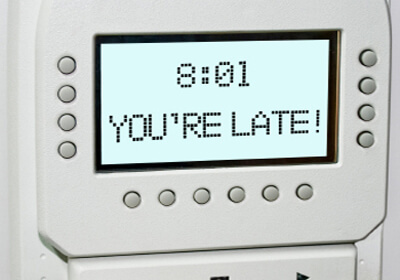 Whether your employee is late or absent, you are paying for work that isn’t getting done. One analyst report puts direct expenses at $660 per employee per year. This amount factors in payroll costs only and does not consider indirect expenses, such as paying for a temporary replacement. It also does not give a true picture of the fringe benefits that are still being earned or the insurance premium increases due to high absenteeism. By not using the right attendance management system, you may be setting your company up for a lawsuit. It is easy for employees to claim you are denying them what they are owed when there is no record confirming or refuting an absence. Also keep in mind that the Fair Labor Standards Act is quite clear: you must pay employees for the overtime they work, even if it is not pre-approved. When an employee is absent from her job, a bit of your competitive advantage leaves with her. Other team members must pick up the slack, which means their own workloads suffer. Morale drops as employees see no effort from management to prevent or discipline slackers. In the worst cases, the work does not even get done. Call centers, fulfillment operations and any business that runs on client appointments tend to suffer the most. When you fail to track start and end times, you waste precious resources trying to monitor and discipline an employee whose attendance history is undocumented. You may need to hire replacement workers or divvy out job duties to other overworked staff members. The time you could spend on strategy and sales is wasted on babysitting. If you don’t measure it, you can’t manage it. Without appropriate time and attendance systems, you cannot obtain a clear picture of how many hours are being worked, when employees are absent, how many are gone or available at any particular moment and why they are late or absent. The extra data from an automated system can help you staff for special events or seasonal sales, track individual time-off approvals, develop flexible working arrangements or alter your benefits packages to meet worker needs. I’m disappointed to read the gender bias in this article. Better editing required! I see that you are referencing the use of “her” in the example in paragraph four. Gender bias wasn’t intended but I understand your perspective since the rest of the article is gender neutral. Thanks for your feedback.